NEW PALTZ, NY: -Fall Foliage at Mohonk Mountain House and Cranwell Resort has inspired many offerings this season for guests to enjoy the great outdoors as well as give their skin some much needed attention after a summer in the sun. Autumn-with its endless sweep of red, gold, and orange-leaved trees- is the perfect time to revitalize and nourish the skin while surrounded by crisp mountain air. Mohonk Mountain House and Cranwell Resort, Spa and Golf Club have created special Spa offerings in celebration of fall foliage. 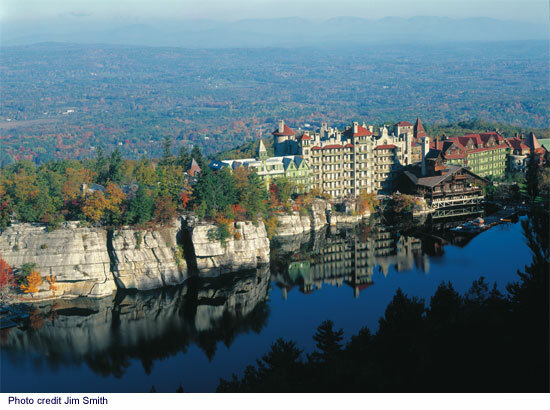 Mohonk Mountain House, a Victorian-castle resort only 90 miles north of New York City located in the heart of the Hudson Valley, has created a new fall-infused facial. The Heavenly Harvest Facial features pumpkin found in the autumn harvest to help bring the complexion back to a clear, radiant and velvety smooth texture. In addition Mohonk Mountain House has introduced a new Spa-tacular Fall Getaway Package available September 4-November 30, 2006 with nightly rates starting at $279 per person (double occupancy), per night, Sunday-Thursday. Guests will have access to 85 miles of hiking trials in the Shawangunk Mountains and enjoy a credit of $75 per person to be applied toward a service in the resort's new 30,000-square-foot Spa, a welcome gift of pumpkin butter, three meals daily prepared by award-winning chefs, along with Afternoon Tea and Cookies. In addition to offering a spectacular showing of fall foliage, the Spa at Cranwell, located in Lenox, Massachusetts overlooking the Berkshire Mountains, offers Spa in the Pantry, a group of spa treatment recipes that anyone can create at home from items found in their own kitchen. The Spa at Cranwell created a special Spa in the Pantry facial mask recipe using fresh apples people often enjoy during autumn when local apple orchards are at their peak. The recipe includes one medium sized apple (grated) mixed with five tablespoons of honey that is then smoothed over the skin. After ten minutes the mask is rinsed away with cool water and the skin is left softened and hydrated. The mask also helps control oil production, calms sensitivity, and tightens and firms the skin. For more information about Mohonk Mountain House or to make overnight reservations, call (800) 772-6646, or visit Mohonk's Web site at www.mohonk.com. Please visit www.cranwell.com for more information about Cranwell Resort, Spa and Golf Club or call (800) 272-6935. Mohonk Mountain House is a National Historic Landmark resort located in the Hudson Valley region of New York State, only 90 miles north of New York City. Mohonk's inclusive overnight rates offer three meals a day prepared by award-winning chefs, plus Afternoon Tea and Cookies, and most recreational activities. The grounds feature exquisite gardens and 85 miles of trails perfect for hiking in the warmer months, and snowshoeing and cross-country skiing in the winter (weather permitting). Throughout the winter, Mohonk's award-winning Victorian Skating Pavilion is host to skating parties, skating lessons, and special activities. A challenging nine-hole golf course, red clay tennis courts, and stables with horseback riding and horse-drawn carriage rides are ideal for invigorating outdoor fun. The half-mile-long, glacial-formed Lake Mohonk is perfect for boating, fishing, and swimming, and is the shining centerpiece of this 2,200-acre resort property. The new Spa at Mohonk Mountain House features 16 treatment rooms, a solarium, yoga/motion room, fully-equipped fitness center, outdoor heated mineral pool and indoor heated swimming pool with underwater sound system. Built in 1894, the historic Gilded Age Cranwell Mansion is a member of the prestigious Historic Hotels of America. The 380-acre, year-round resort is set on a hilltop overlooking the Berkshire Mountains and features 107 deluxe guest rooms and suites, 16,000-square-feet of conference space, three restaurants, four Har-Tru tennis courts, indoor and outdoor heated pools, 10 kilometers of cross-country ski trails, and an 18-hole Championship Golf Course with the nationally renowned Golf Digest School. The Spa at Cranwell was named as one of the world's best spas in the 2004 edition of "100 Best Spas of the World" guidebook. Located just 2? hours from New York City and Boston in the historic New England village of Lenox, Massachusetts, the 35,000-square-foot Spa at Cranwell is a state-of-the-art facility featuring a wealth of world-class amenities with dozens of spa treatments found only in the most prestigious European spas. In addition, it offers lounges with fireplaces, saunas, steam rooms and whirlpools, a comprehensive Fitness Center and a large heated indoor pool.